December 14, 1966 was an extremely significant date in the history of Glessner House Museum. It was on that date that the deed for the house was filed for record with the Cook County Recorder of Deeds, officially transferring the house to the newly formed Chicago School of Architecture Foundation, and thus securing the future of H. H. Richardson’s masterpiece of urban residential design. 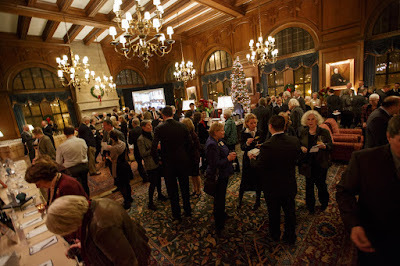 On December 14, 2016, exactly 50 years later, nearly 200 people gathered at the Chicago Club for a special gala celebration to mark that anniversary by honoring our past, celebrating our future, and setting the stage for our next 50 years. A number of individuals involved with the house in its early years were present, including four of our founders – Wayne Benjamin, Wilbert Hasbrouck, Dirk Lohan, and Ben Weese. 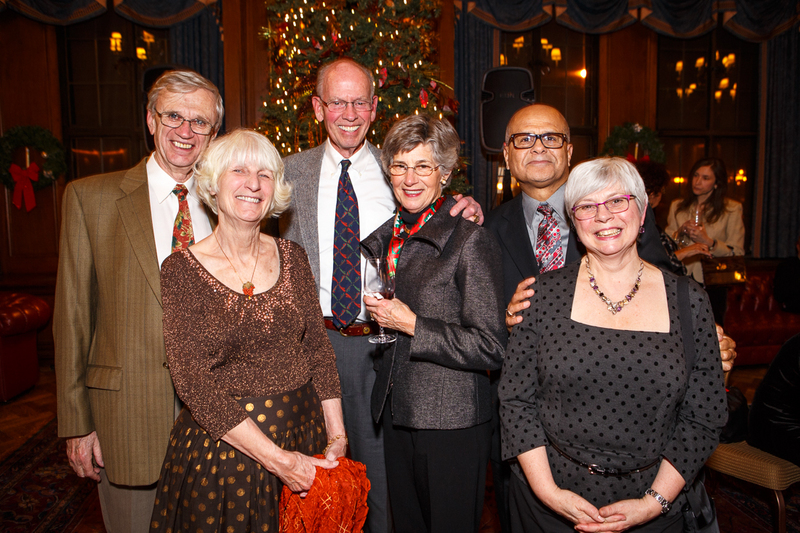 Early docents, staff, and board members renewed acquaintances and shared their memories of why Glessner House Museum is important to them. The event netted $70,000 – twice the amount that was needed to purchase the house in 1966! 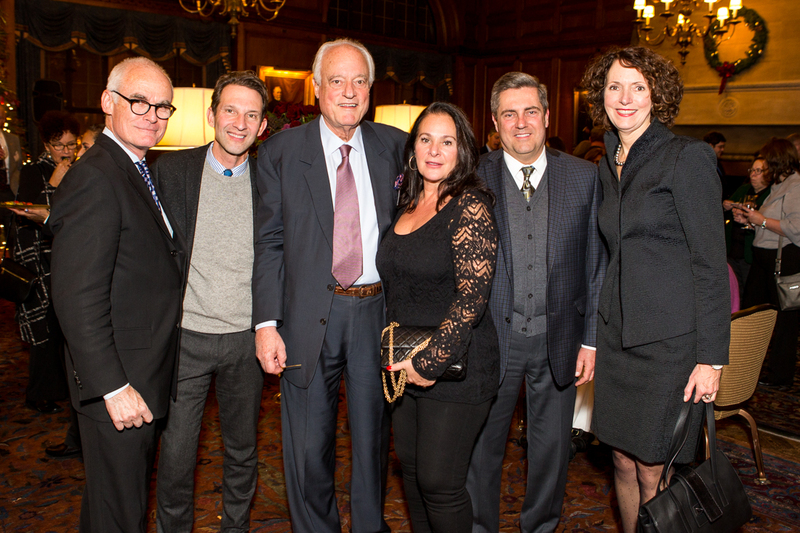 The gala was underwritten by a generous grant from The Richard H. Driehaus Charitable Lead Trust. Dirk Lohan served as Honorary Gala Chair, and Ben and Cynthia Weese were Gala Co-Chairs. 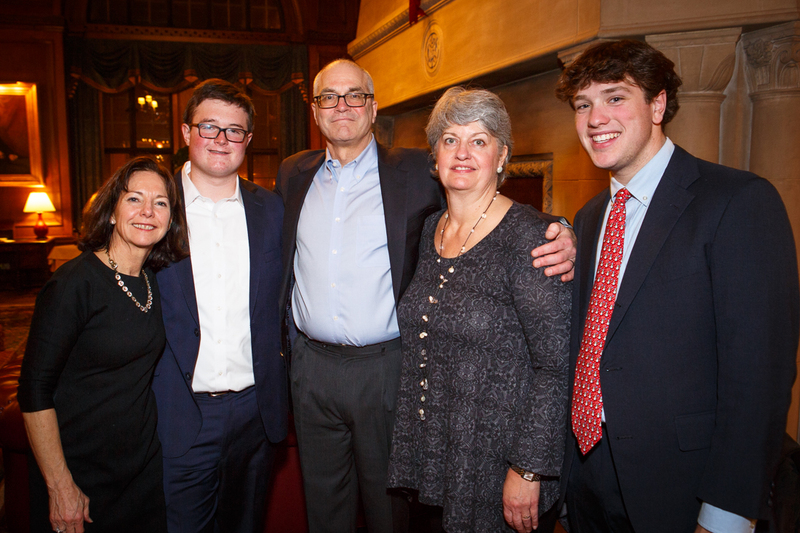 At 6:30pm, Executive Director and Curator William Tyre welcomed everyone and noted the significance of the occasion, acknowledging special guests including our founders, and several members of the Glessner family who had traveled from Massachusetts and New Hampshire. Four individuals were honored with awards featuring a handcrafted replica of a portion of the wrought iron grille on the front door – one of the most iconic design features of the house. 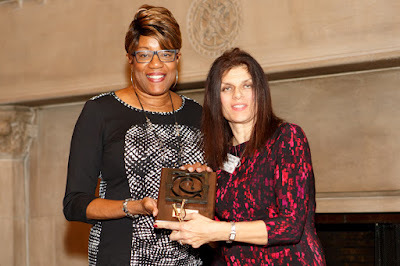 The first award was presented to Toni Preckwinkle by board member Bonnie McDonald, president of Landmarks Illinois. McDonald noted how Preckwinkle had been mentored early in her career by Leon Despres, long time alderman, known as the “liberal conscience of Chicago” during his two decades on the City Council. 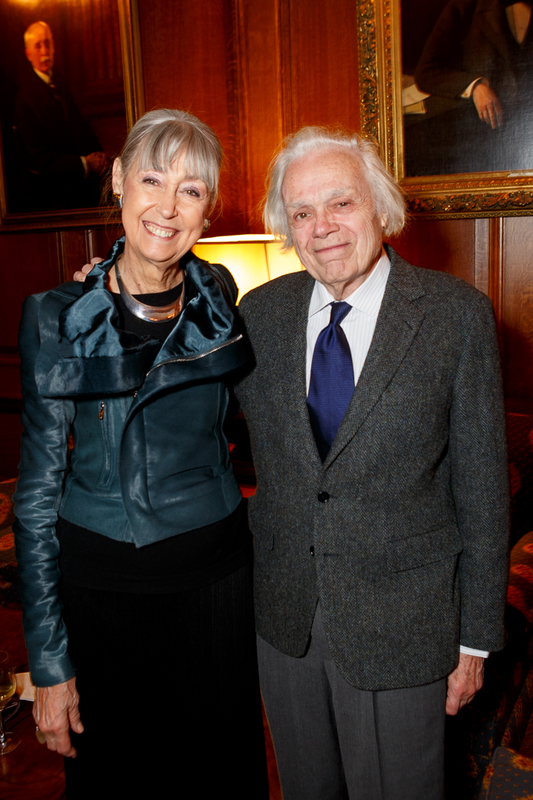 Despres and his wife Marian were two of the individuals who provided funding to purchase Glessner House in 1966. 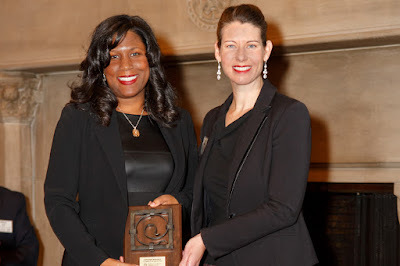 Preckwinkle was in Boston at a conference, but recorded her acceptance noting that Despres shared a valuable piece of information with her, “There is no end to the good you can do as long as you don’t care who gets the credit.” The award was accepted on her behalf by Jessica Caffery, Director of Real Estate Management for Cook County, who noted Preckwinkle’s commitment to the preservation and adaptive reuse of the old Cook County Hospital building. 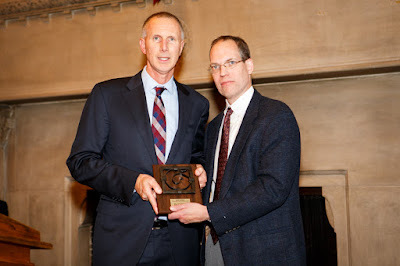 The second award went to Jack Tribbia, and was presented by board member John Waters, an architect with the Frank Lloyd Wright Building Conservancy. 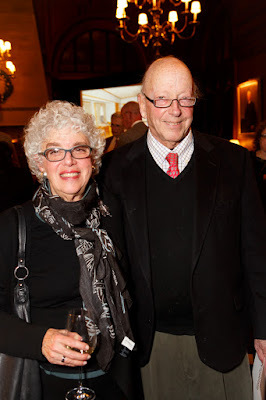 Jack Tribbia is the President of the Restoration Division of Berglund Construction and has been involved in the preservation and restoration of many of the most important buildings in the Chicagoland area ranging from the Museum of Science and Industry to the Shedd Aquarium, and from the Sullivan Center to Farnsworth House. Jack served as a board member at Glessner from 2005 until 2011, and has remained active since that time, providing valuable consultation and advice on a variety of building projects. Pat Dowell, Alderman of the Third Ward, received the next award, presented by board member Mary Kay Marquisos, former Senior Director of Communications with the Metropolitan Pier and Exposition Authority. Marquisos noted how Dowell has been a strong voice for community-based development, constituent engagement, and transparency. 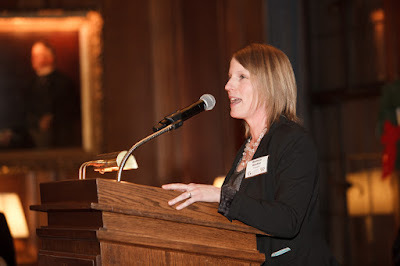 Dowell has been an advocate for historic preservation and has landmarked more than half a dozen buildings and districts in her ward. Mostly recently she was deeply involved in the massive $132 million restoration of the Rosenwald Court Apartments at Michigan Avenue and 47th Street. The Lifetime Service Award was presented to Bob Irving by board member Pauline Saliga, Executive Director of the Society of Architectural Historians. 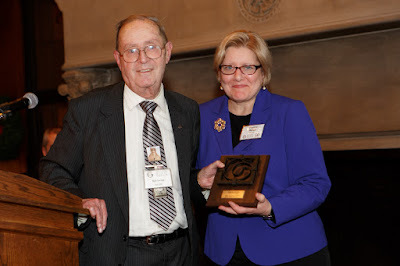 Irving, a retired Professor of Humanities at the Illinois Institute of Technology, joined the first docent class at Glessner House in the spring of 1971 and was one of 33 to complete the rigorous training course that June, being trained to give tours of Glessner House and a walking tour of Chicago School buildings downtown. In the early 1980s, he developed a new walking tour called the “Riverwalk” which evolved into the now world-famous CAF River Cruise, one of the top tourist attractions in the city. 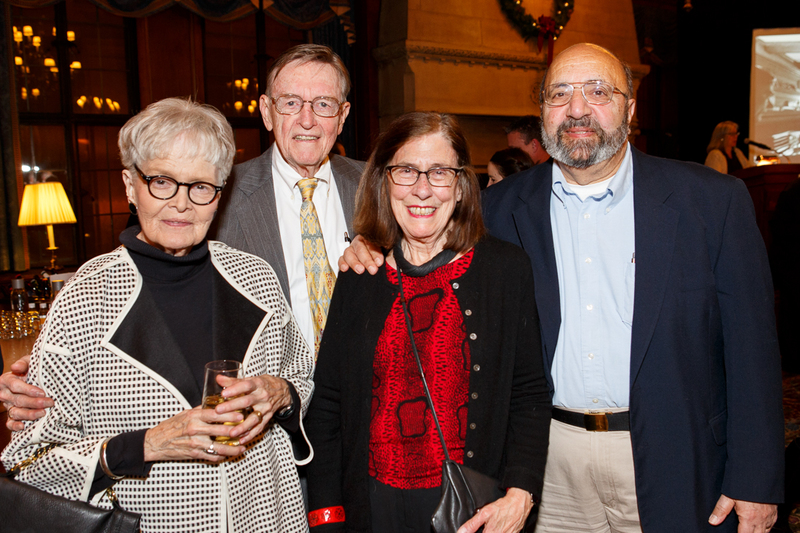 Irving has served continuously as a docent at Glessner House for 45 years, his encyclopedic knowledge and quick wit making him a visitor favorite for decades. 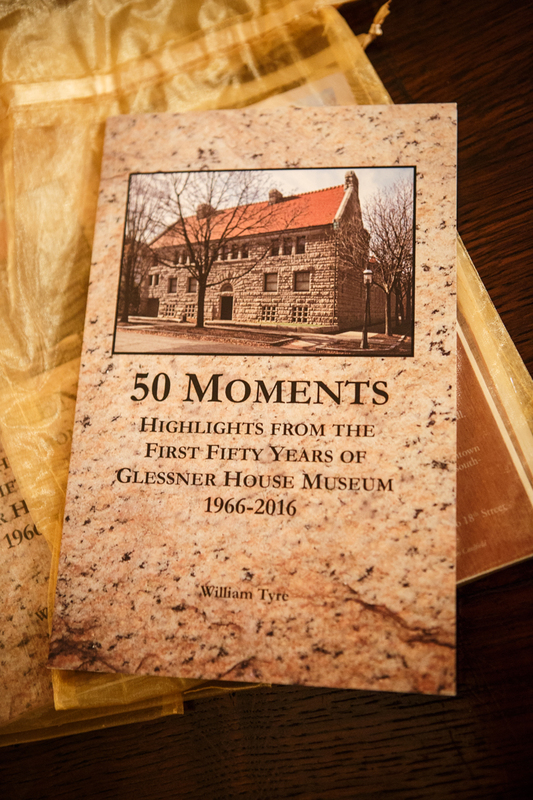 All attendees received a copy of the just published 50 Moments: Highlights From the First Fifty Years of Glessner House Museum 1966-2016 authored by William Tyre. The book is now available in the museum store. 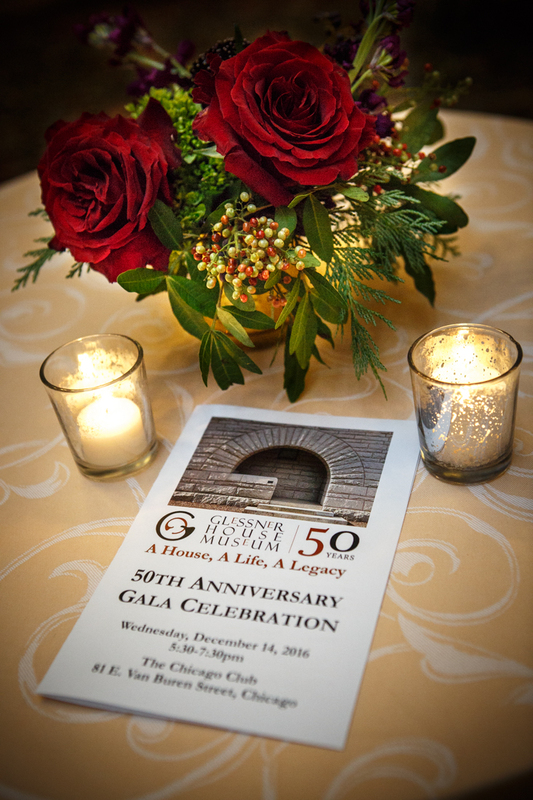 The gala was a fitting way to close the celebration of our 50th anniversary, as well as launch the first day of our next 50 years! Our mission is to spark excitement in architecture, history, and design through a dynamic exploration of Glessner House, its family, and its preservation. The House is open to visitors for guided tours Wednesday through Sunday at 11:30am, 1:00pm, and 2:30pm. Tours last approximately 75 minutes. Tickets are $15 for adults, $12 for seniors and students, and free for children ages 5 and under. Wednesdays are free for all.